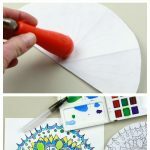 Mandalas are fascinating, and there are a number of ways to go about making them, but we are going to focus on the most simple mandala technique ever today. 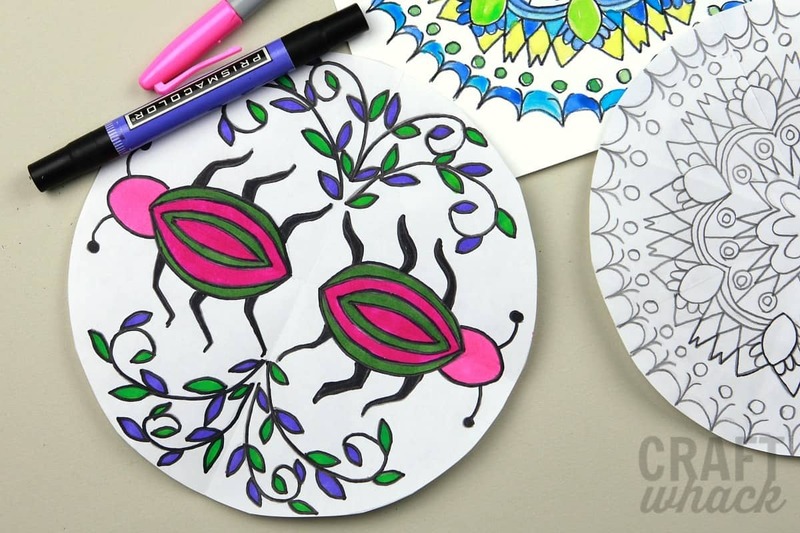 In fact, it’s sort of mind-blowing when you see how easy this project is to help you make really lovely, intricate-looking mandalas. 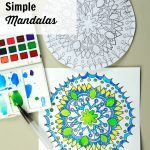 I found this wonderful easy mandala project on Incredible Art, and it’s a good one. First, a little info about mandalas. 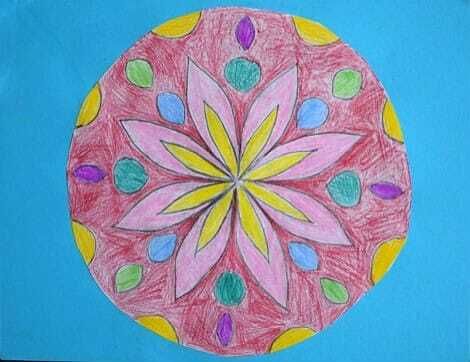 Mandala is a Sanskrit word loosely meaning circle. 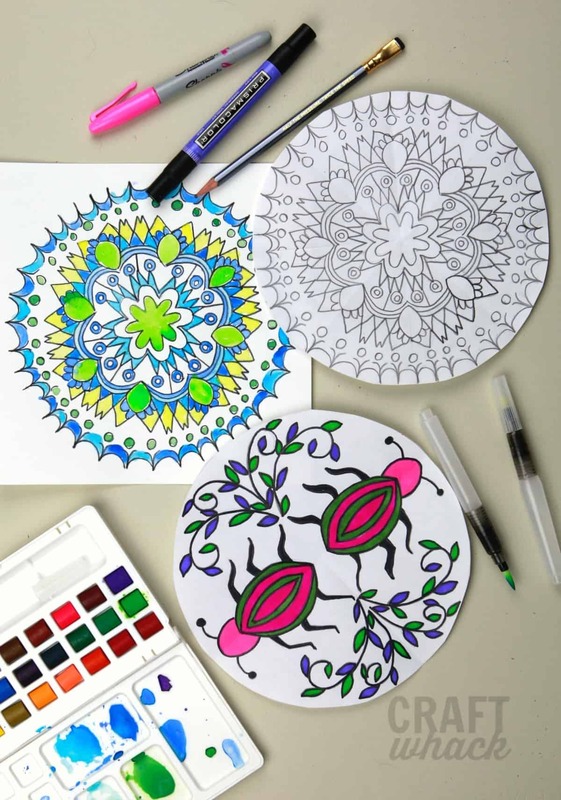 I assumed that mandalas were solely a Buddhist art form, but they have been created by people from different religions for centuries. They are intricate, repeating geometric shapes that make up a circle. Basically mandalas symbolize our universe, and the idea that everything in our universe is connected. If you are making these with kids, these will give them a taste of design, proportion, symmetry, and working with abstraction. Plus, they are meditative. And mathariffic. And beautiful. You’ll probably like to learn to draw a labyrinth if you like this mandala project. 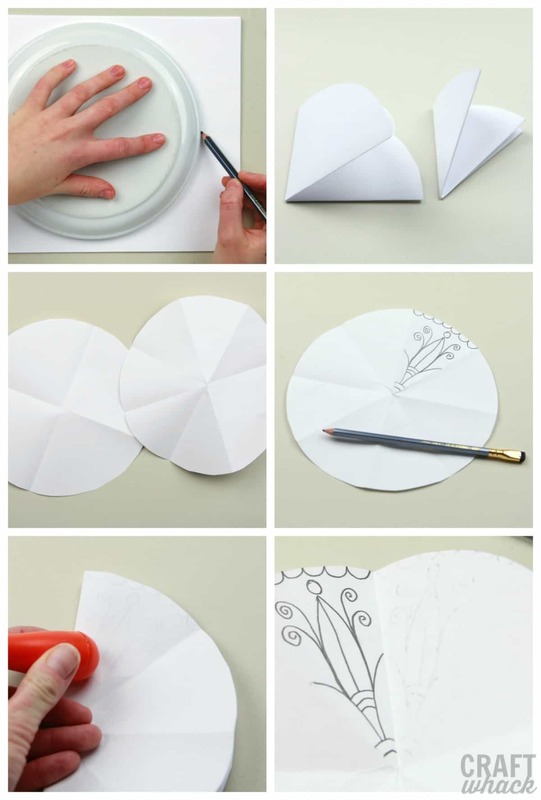 Cut out the circle carefully – hold 2 pieces of paper together to double time your cutting process, since you will want to be making more than one of these thangs. Fold it in half again (unless you’re making the simpler mandala). 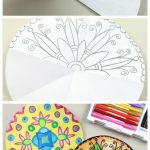 Draw a design on one of the paper pie pieces, being sure that some of your lines touch the edges of the pie piece. 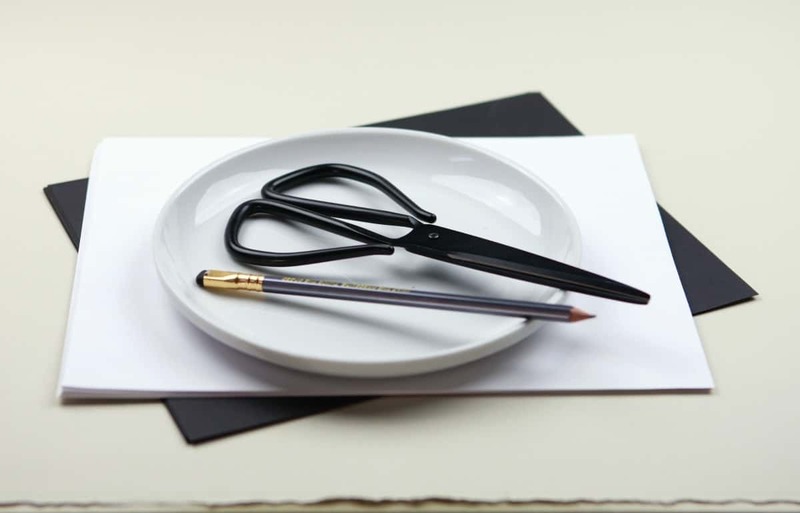 Using the existing crease, fold the drawn pie piece over onto the piece next to it and rub with the edge of a bowl, a bone folder, the back of a spoon, whatever will transfer the pencil marks onto the blank pie piece. Press pretty hard! For some reason, I found that the bottom of my Speedball block cutter worked better than the back of a spoon, and the only thing I can think is that the plastic works better than metal? 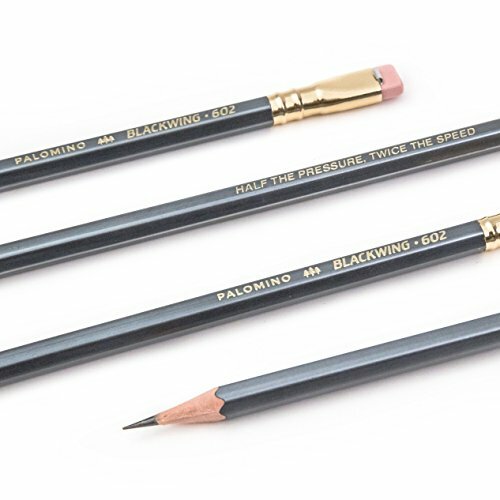 Go over the transfer lines with your pencil to darken them. Fold these two pieces over onto neighboring two pieces and repeat the rubbing and darkening process. 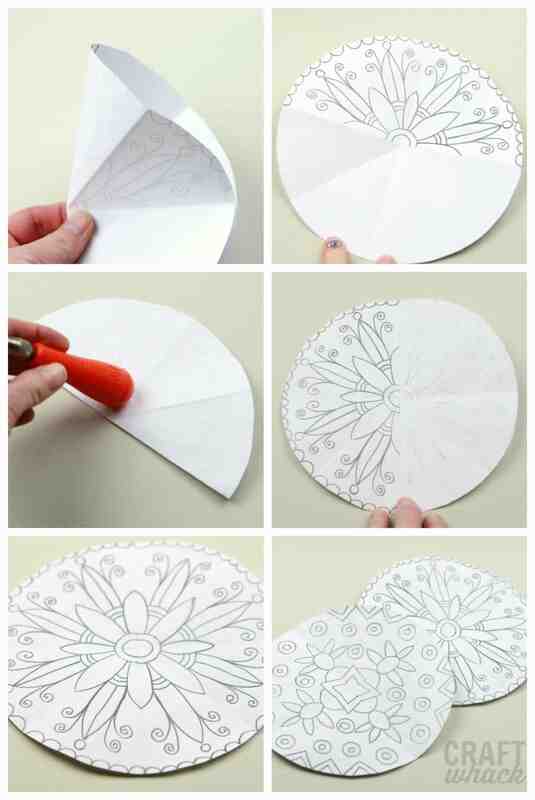 Fold these 4 onto the blank 4 pieces and repeat the transfer. Darken the transferred lines with pencil. Folding: You can stop at folding the circle twice, which I recommend for kids, or if you want a simpler design. I liked the way this looked equally as much as the paper folded in eighths. 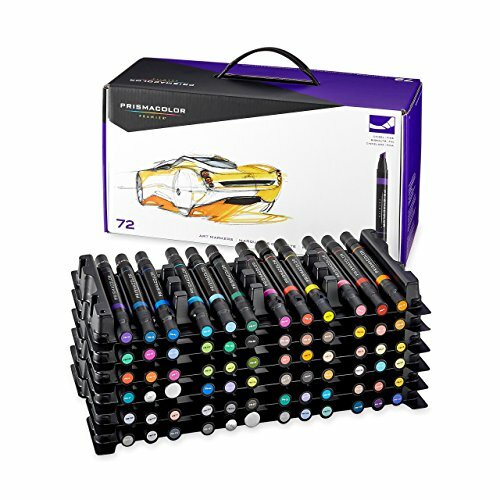 Draw over the pencil lines with a fat Sharpie marker and colored in with markers. This works better on the more simple mandala, since the lines on the more intricate ones will be obliterated by the big Sharpies. 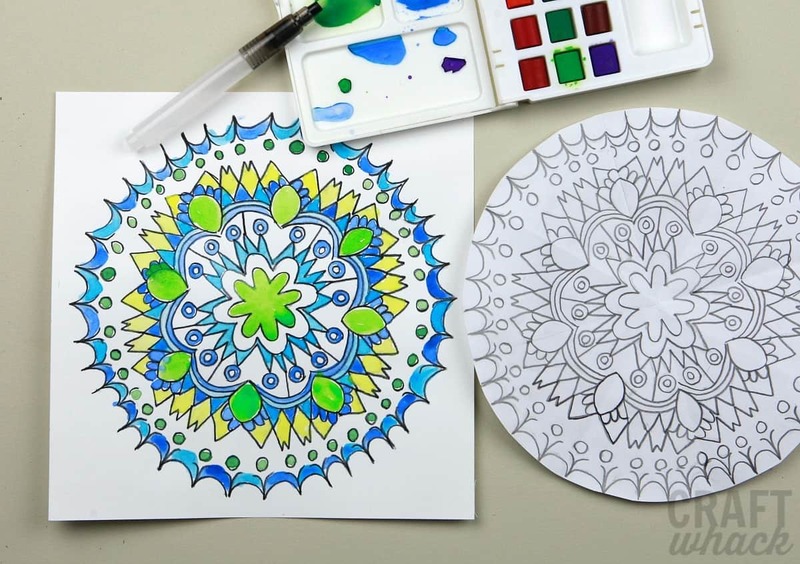 Ultra fine Sharpies don’t work so well over the heavy pencil lines, so for more intricate mandalas you can scan them! I scanned this baby in, then adjusted the contrast in PicMonkey, and cleaned up the fold lines that showed up in the scanning process. I printed it out on white card stock and watercolor painted it. Oooooooh. If you like this idea, you’ll LOVE my Draw Your Own Damn Coloring Book. 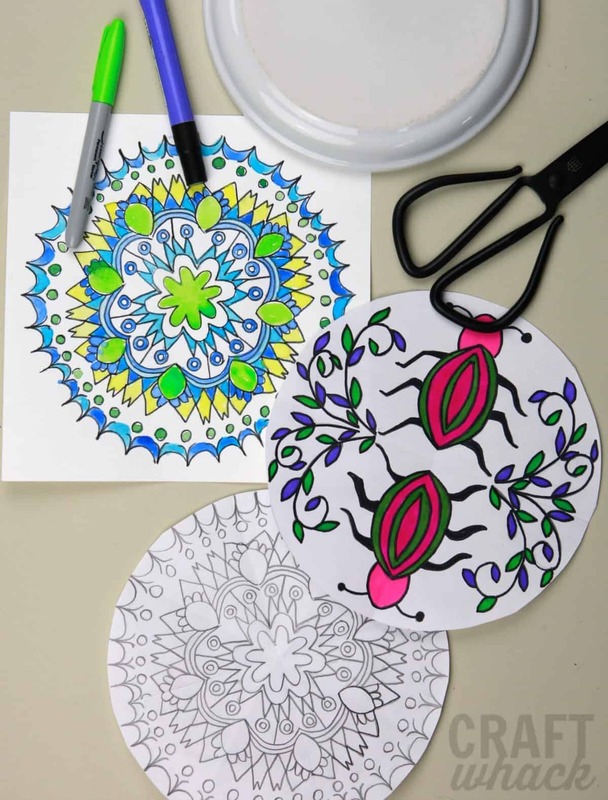 Make tiny temporary tattoos from your scanned-in mandalas! When you finish the pencil line darkening, flip the whole thing over and transfer it onto a sketchbook page. It will make a cool light background pattern. 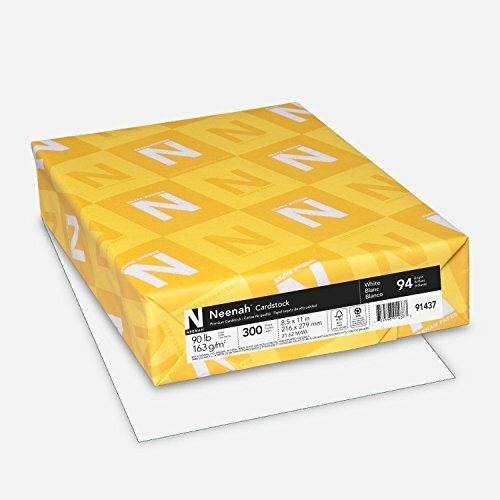 Use transfer paper to make a t-shirt or canvas bag. ZOMG, when you have an extra 16 hours to waste, click on over to Mandala Maker and go wild. It’s totally addictive fun. 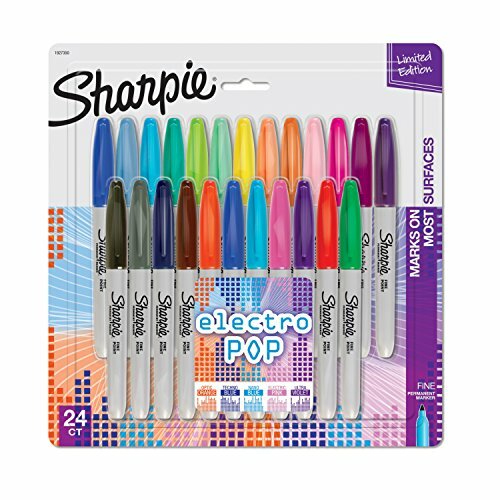 Since you’re probably jonesing to keep using your markers, go have a look at all these Sharpie art ideas. 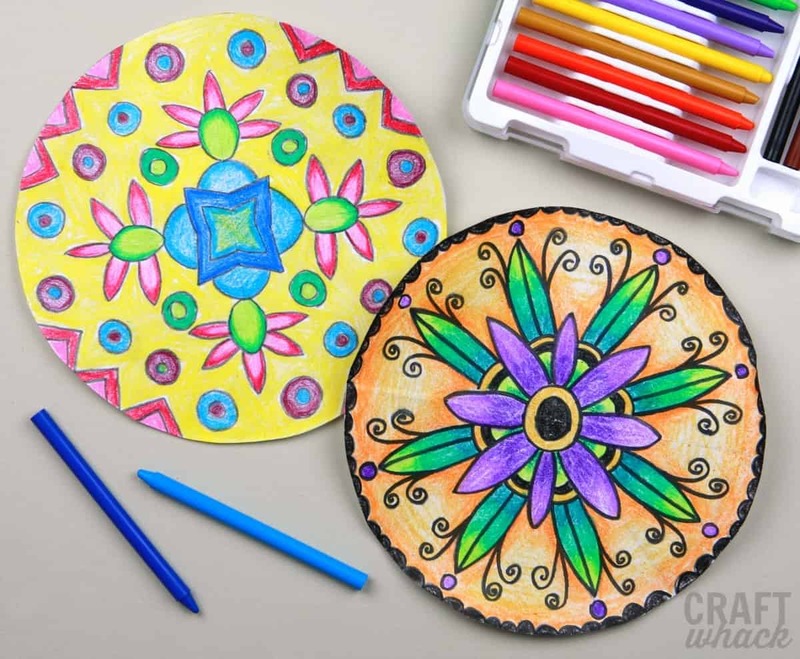 Here are some of the supplies I used on these mandalas. This post is a freshened-up post I wrote in 2013, and here is the original mandala I made. It’s mounted on colored paper with glue stick. Thanks Jeanette! 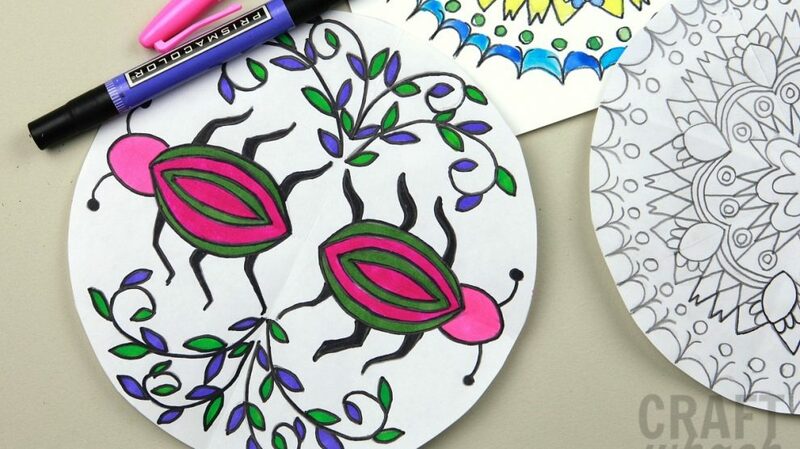 Your Mandalas turned out so beautifully. For me they are very pleasing to look at. And that’s a great idea to repeat 8ths 10 times fast – tricky. Great geometry tie ins too. Thanks again for being open to requests. Your answers are always so interesting. Many years ago I had the pleasure of watching a Buddhist sand mandala being created. It was an amazing experience. How cool- that must have been amazing. Aruna told me about those in the email she sent me for this post, so I You Tubed some. So intricate, and then they’re just brushed away! To me, the pencil transferring was the most fun part of the project. It was. 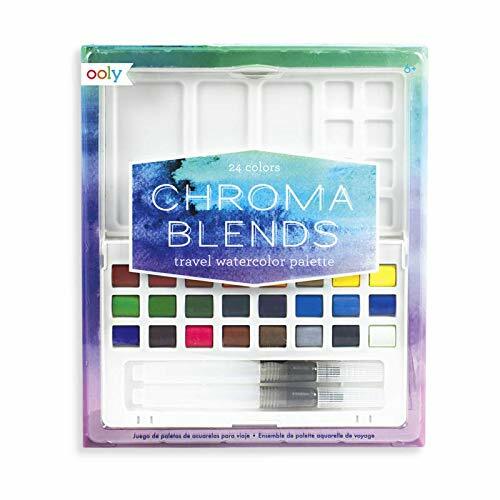 It really got me interested in transient art (and performance art), where the purpose of creating an artwork is the process rather than the completed product. It’s an interesting concept to wrap one’s mind around – how we form attachments to our creations; is it possible to let it go? I didn’t see the de-creation of the mandala, but the monks told us the process was almost as intricate as creating it – where the sand from each section would be collected in turn and then there would be a ceremony where the sand would be poured into a river so that the energy of the whole exercise would flow out into the country, to the ocean, and eventually the world. I didn’t realize it was so easy to create your own Mandelas. We usually get a print out to do them. I like your version much better! The print outs are really fun to just sort of space out and color in- we love those, too. The transfer part just gives this a little twist on thinking about the different shapes that make up the whole, I suppose!